With Cyber Monday in full swing, the nefarious villain Rita Repulsa (Elizabeth Banks) has "taken over" the Power Ranger's Twitter today. As part of her Twitter takeover, three new photos have arrived, giving us a better look at Rita Repulsa's powerful gold weapon, while this villain interacts with fans, offers her top five picks for "Repulsa's Must Have" items and even her own Cyber Monday "deals". She even gives fans a list of "fantastically vile" gifts, which include "suitable explosives," "costume claws," "homegrown monsters" and an "atomic energy kit." 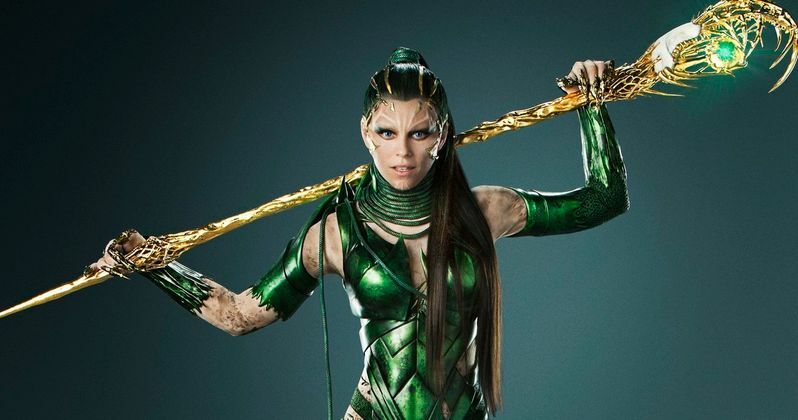 Early this morning, Rita Repulsa announced her Twitter takeover with the first new photo, with the powerful villain revealing she's finally been freed after 65 million years. Since she has a lot to catch up on, she has been taking to Twitter regularly to deliver a few insults to fans, while even taking a jab at Oprah Winfrey, claiming that, while Rita Repulsa does appreciate "powerful women," Oprah's tastes are too "saccharin" for Rita's liking. This villain even takes a few jabs at two of Lionsgate's biggest franchises in her ongoing Twitter rant. One of her tweets pokes fun at The Hunger Games, stating that President Snow is "onto something," as she volunteers all five of the Power Rangers as tributes. Ironically enough, that tweet features a GIF of all five of the Power Rangers' names shown on a piece of paper opened by The Hunger Games character Effie Trinket, played by Elizabeth Banks. Another recent tweet pokes fun at Lionsgate/Summit's Twilight franchise, with Rita stating that her monsters never turn out so "ravishing" and that she wants to sink her teeth into Robert Pattinson's Edward Cullen, while drawing a green heart around a photo of the vampire. Power Rangers stars Becky G (Yellow Ranger), Naomi Scott (Pink Ranger), RJ Cyler (Blue Ranger), Dacre Montgomery (Red Ranger) and Ludi Lin (Black Ranger), with Elizabeth Banks also starring as the villainous Rita Repulsa. It was also recently confirmed that Bill Hader will provide the voice of Alpha 5, while Bryan Cranston will portray Zordon in this remake. Fans are still waiting for the next batch of footage after the first trailer debuted at New York Comic Con last month, but the studio has yet to confirm when the second trailer will arrive. This new update of the Power Rangers TV show follows five ordinary high school kids who must become something extraordinary when they learn that their small town of Angel Grove, and the world, is on the verge of being obliterated by an alien threat. Chosen by destiny, our heroes quickly discover that they are the only ones who can save the planet. But to do so they will have to overcome their real-life issues and band together as the Power Rangers before it is too late. Power Rangers hits theaters March 24, 2017, going up against Warner Bros.' King Arthur: Legend of the Sword and Sony's Keep Watching. Take a look at all of the tweets from Rita Repulsa's Twitter takeover below.